University of Melbourne academic staff and postgraduate students can book an individual research consultation. An archive is a collection of records created during the daily life of an organisation, company or individual. The records held in archival collections are selected for preservation because of the ongoing value of the information they contain or because they provide evidence of the conduct of affairs of their creator. "Archive" can also refer to the institution that houses these collections. 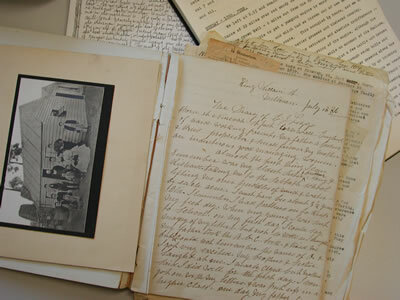 Archival collections differ from library collections in that they contain unpublished, original and unique records. Library collections on the other hand contain published books that can be accessed through open-shelf browsing. Because of their uniqueness, archival collections can only be accessed ordering specific records that must be viewed in secure reading rooms. Also, archival collections are arranged in the order in which their creator maintained them. A library, on the other hand, arranges its collection according to subject. Contain published material (e.g. books, journals). Contain unpublished material. Material is organised by subject. Material is organised according to the original order in which it was maintained. Find material by checking the library catalogue or browsing the shelves. Find material through lists (often called 'finding aids'). Browsing is not allowed. Borrowing is allowed. Borrowing is not allowed.